Fairly quiet weather will ensue before the pattern acts up on Sunday. A couple of rainy spells will be possible over the next 10 days. Today and Tonight: A few showers will remain possible for the southern half of the forecast area, especially near the coast, through early Friday. Due to the slow moving front, cloud cover may be an issue for much of the day, limiting high temperatures to the mid 50s. Skies will clear late and with northwesterly winds, low temperatures should have no problem dipping into the mid 30s. Up Next: After a chilly start, Saturday will be seasonable with occasional peeks of sun. Highs will push 70 degrees by Sunday but rain and thunder are likely. A washout is possible and some locations may get a healthy soak of up to an inch. It now looks as though showers and thunderstorms may carry into Tuesday or Wednesday of next week before a break. Long-term trends suggest that temperatures will moderate by next weekend. Leading into Christmas, a stormy pattern may unfold with widespread rain across the Eastern United States. Forecast models have been steadily suggesting that a cold front will pull temperatures back down just in time for the holiday. For many, that could be considered an improvement in the Baton Rouge area over record warmth from the previous years. The Explanation: A cold front will chug slowly into the Gulf of Mexico today. A stream of moisture from the southwest will move across this boundary, upsloping and creating a stratus deck stretching as far north as Mississippi. Closer to the coast, enough moisture is expected to be available to allow some showers to develop. Rain will be possible along and south of I-10 through the first half of Friday, with clouds holding on a bit longer. Sun may be tough to come by on Friday, and therefore temperatures will remain in the mid 50s. Another cold night is then expected until the broad trough responsible for days of at or below average temperatures will move east into the Atlantic Ocean. Moisture will begin to rise as surface high pressure shifts east and southerly flow develops. An upper level system will initiate frontogenesis over the weekend and bring the next chance of rain on Sunday and into next week. Forecast models have dramatically shifted in slowing a slower evolving pattern. Rain and thunder now appear possible through Tuesday and possibly Wednesday. 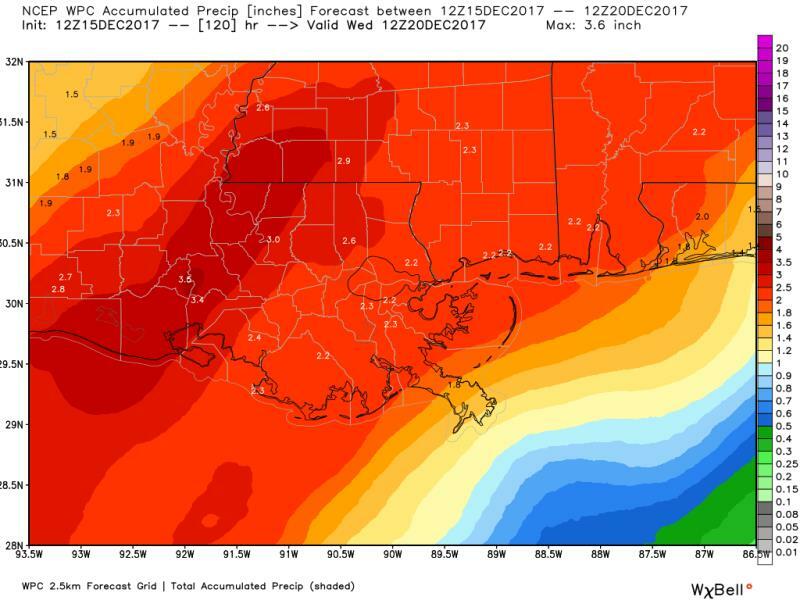 Some healthy rainfall totals could result with 2-3 inches possible around the region. The GFS eliminates precipitation by Wednesday while the ECMWF keeps it wet through mid-week.